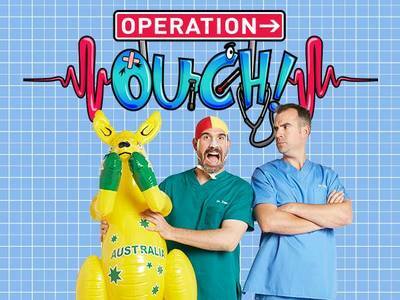 Following their sold out Australian tour in January 2017, Dr Chris and Dr Xand, the stars of hit ABC Me children’s television series Operation Ouch! are coming back to Australia with a brand new show in 2018. The Operation Ouch Live! Summer Tour will travel all over Australia in the early part of 2018 and the identical twins will perform at The Plenary, Melbourne Convention and Exhibition Centre on 23 January. Dr Chris and Dr Xand are all set to stage more incredible medical stunts and even crazier experiments. Expect to be wowed by fascinating facts about biology and the incredible things your body can do. Plus the duo will share their favourite bits from their award winning Operation Ouch TV show, too. Check in here for last year's KidTown Melbourne review! Don’t miss Dr Chris and Dr Xand LIVE ON STAGE as they explore medical science from a kid’s-eye view in Operation Ouch! Live on Stage at The Plenary. When: Tuesday 23 January, 12, 2:30 & 5:30pm.